Handyman or Contractor? What’s the Difference and Who to Call? When inevitably, something goes wrong within your home, you may be faced with the age old question: can I do this myself? We tend to lean more towards yes for the money saving element of do-it-yourself fixes, but the bottom line is that some jobs can be dangerous if you do not know what you’re doing. It is important, then, to audit your skills and abilities as a handyman when faced with homeowner follies in need of a hasty remedy. If that fact remains that you just do not have the skill and experience necessary for a specific job, or find yourself at all apprehensive, then it is time to call in for reinforcements. In making this decision, however, another dilemma reveals itself. Licensed contractor or handyman? While there is value in each, knowing when to distinguish which jobs warrant which service is vital. In this article, we will outline the fundamental differences between licensed contractors and handymen and who should be hired when. So, what is a licensed contractor? Contractors set themselves apart from any guy with a tool set through their licensure. The official nature of their expertise within a trade is awarded to contractors by the state in which they operate. They are registered based on certain state-held requirements for work in a given trade, most of which reflect some sort of proficiency exam and minimum apprenticeship experience. Hiring a licensed contractor generally means the person doing the work has the background and training necessary to handle any and all types of work within a certain range of work reflective of a contracting discipline. Licensed work is done up to code and meets all state regulations so that your home is always able to pass inspection should you decide to list the property at some point after the work is done. This means permits are pulled, and the municipality knows when a job is started and requires inspection at the job’s completion. There are both positive and negative implications associated with this. While hiring a licensed contractor ensure the work will be done correctly and up to snuff, the red tape inherent to licensed work can sometimes delay a job. The difference in hiring a handyman? The major difference between a licensed contractor and a handyman is the simple fact that a handyman operates off the books, so to speak. Handymen do not have any licensing, and while they may have expert experience in a certain trade, there is no formal documentation of this expertise. The fact of the matter is that anyone can call themselves a handyman. That is not to say that hiring one is setting yourself up for a scam. 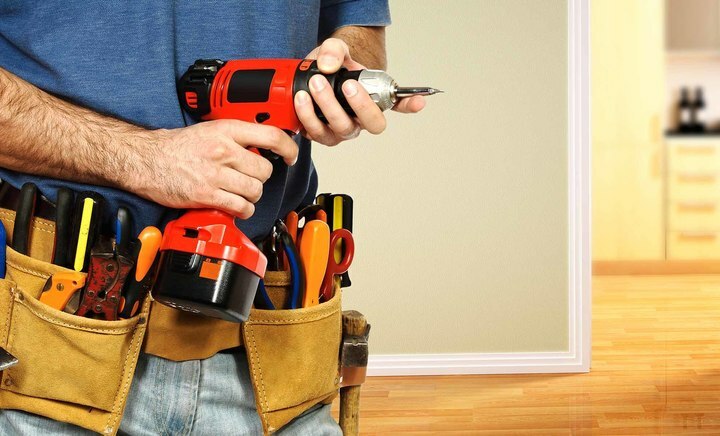 Most handymen are skilled and can handle a lot of home repairs. This is the key consideration to make- whether or not the job requires licensing. In other words, will the job have to be inspected at some point, or are their state code requirements associated with the type of work? If the answer to this question is yes, and you still go through with hiring a handyman, you could set yourself up for a series of fines, in addition to the price associated with having the work done over by a licensed contractor. In some states, there are other arbitrary systems in place for when licensed contractors should be used in addition to whether or not there are trade codes in place. For instance, in California, it is necessary to use a licensed contractor any time the scope of the work including material and labor exceeds $500. This again depends on the type of work being done. In general, size or intricacy is a good indication of whether or not a licensed contractor is required. For example, if you are deciding to upgrade a bathroom aesthetically with new tile, paint, fixtures, and flooring, a handyman is likely acceptable. If this same renovation requires making the room larger through manipulation of the outer boundaries of the room and home, or involves anything to do with the plumbing system, more times than not it would be best to use a licensed contractor. That is because these elements are those that are subject to code inspection. While there are handyman who are capable of doing the work, and you may not be thinking of selling your home and thus subjecting it to inspection any time soon, at some point down the road, this oversight could end up costing a great deal of money. A more clear rule of thumb to consider for when licensed workers should be hired over handymen is cost. When you are in need of a home repair that costs more than you would uncomfortable losing should something go wrong, then a licensed contractor should be hired. Licensed contractors are required to insure their work, meaning whatever you paid out for the repairs is covered should a freak accident take place that compromises the work. Licensed guys are also more specialized. Every day, in adherence with their licensure, they work within the same discipline to the extend that most moderately difficult and even dangerous jobs are routine for them. Is the work being done something that will require inspection should you decide to list your home? Are their professional codes and safety standards associated with the job? Does the job involve a utility system? Is the cost of the job significant enough to warrant insurance? If the answer to any of these questions is yes, give yourself the peace of mind of hiring a licensed contractor.